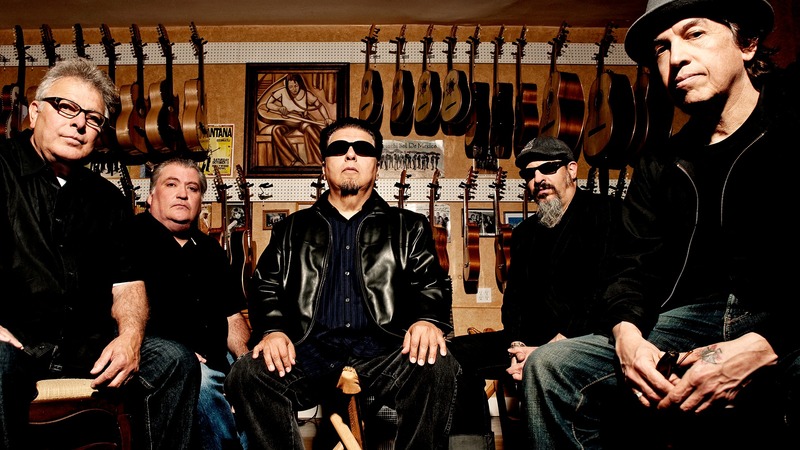 Louie Perez of Los Lobos is calling from Los Angeles, and for a brief moment he turns the tables on the interviewer and starts asking questions. The band formerly known as Los Lobos del Este de Los Angeles had just released its latest studio album,”Gates of Gold (429 Records), and it finds the band shuffling styles and taking risks with the hunger of their early days. “We’ve been around a long time — it’ll be 42 years for us next week. Does this mean critics say ‘ho-hum’ when we release another album?” Perez asks. As easy as it might be to take Los Lobos for granted in the way it has managed to maintain a high standard across the decades, it would be a mistake. Gates of Gold, released in September, contains some of the quintet’s best work. The acoustic title track finds the group, sons of Mexican immigrants, contemplating the promise of a new country that greeted their ancestors and their own mortality. “Mis-Treater Boogie Blues” oozes nastiness, the guitar break in “Made to Break Your Heart” evokes vintage Neil Young and Crazy Horse, and the rampaging “Too Small Heart” evokes the Jimi Hendrix Experience. But the best moments bubble through in the jazzy exploration of “When We Were Free” and the eerie soul of “There I Go,” which sounds like a stray track from D’Angelo’s latest album. Neither song sounds quite like anything Los Lobos has tried before. That shared musical language, the ability to find their voice in myriad styles of music, began taking shape as Perez, Hidalgo, Cesar Rosas and Conrad Lozano were growing up in East Los Angeles in the late ’60s and early ’70s (they were joined in the ’80s by saxophonist Steve Berlin). It’s a journey chronicled in a fine recent biography of the band, “Dream in Blue” (University of Texas Press), by veteran rock journalist Chris Morris. It details how the band dug into its Mexican heritage in the ’70s with traditional acoustic instruments, playing weddings and at restaurants in the barrio, then transitioned into the punk and Americana scene flourishing in Hollywood alongside X, the Blasters and Social Distortion in the early ’80s. A brief flirtation with pop fame, thanks to a No. 1 hit with a cover of Ritchie Valens’ “La Bamba” in 1987, prompted the band to take a left turn and mate traditional sounds with psychedelic experimentation on its masterpiece, the 1992 Kiko album. The group continued to write and record new material in recent decades and even enjoyed its first Top 50 album in three decades, Tin Can Trust in 2010. All the while, the core lineup has never changed, a rare occurrence for any band. The band remains in demand and their touring schedule heavy, including stops at the Lincoln Center Performance Hall on Wednesday and the Boulder Theater on Thursday. The Fort Collins show is being billed as “A Celebration of Mexican-American Heritage” because the band will combine with Ballet Folklorico Mexican to offer a performance that includes song, dance, music and film that highlights the contributions of Mexican-Americans in U.S. history. Yet, Perez says the band wouldn’t continue if it stopped writing new songs. “We can’t set that aside, that would prune us back to a stub creatively,” he says. “David was sending me YouTube videos and a lot of that stuff rubbed off on the new album. That big guitar explosion in the middle of ‘Made to Break Your Heart,’ it’s like a Les Paul atom bomb, and then there are these guitar orchestrations on ‘Magdalena,’ which is cool.